Product prices and availability are accurate as of 2019-04-13 10:48:08 UTC and are subject to change. Any price and availability information displayed on http://www.amazon.com/ at the time of purchase will apply to the purchase of this product. Liberty Pumps 287 is a 1/2HP Automatic Submersible Sump Pump with with magnetically operated vertical float VMF switch and 10ft power cord. Turn-on level of the not adjustable switch is 9-1/2" and turn-off level is 4". This pump can operate in a smaller 10" diameter sump pit.The Liberty Pumps 287 has 1-1/2" NPT discharge, 3/4" solids-handling, 37' shut-off head, a unique one-piece cast iron housing and thermally protected permanently lubricated motor.Liberty Pumps 287 is a 1/2HP Automatic Submersible Sump Pump with with magnetically operated vertical float VMF switch and 10ft power cord. Turn-on level of the not adjustable switch is 9-1/2" and turn-off level is 4". 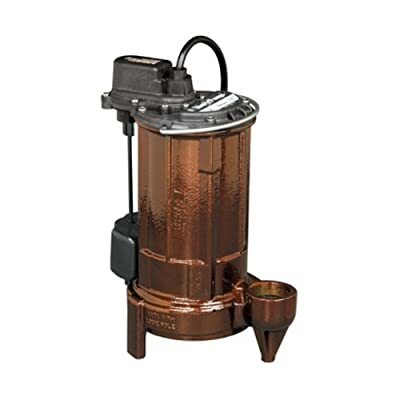 This pump can operate in a smaller 10" diameter sump pit.The Liberty Pumps 287 has 1-1/2" NPT discharge, 3/4" solids-handling, 37' shut-off head, a unique one-piece cast iron housing and thermally protected permanently lubricated motor.For Sump and De-watering Applications only. This Vertical Magnetic Float (VMF) model is not recommended for effluent applications due to their short On/Off cycle. Wide angle float models (Liberty Pumps 281 and 283) are better suited for effluent applications and are easily adjustable for different On/Off levels.For added protection, consider the addition of a back-up pump such as Liberty's SJ10 SumpJet, as well as an alarm such as Liberty's ALM-2 in applications where loss of pump function could result in property damage. If an alarm is used, it must be connected to a separate electrical circuit.CAUTION Do not let the pump run dry.